User must have a Microsoft work or school account. Azure AD guest users, also known as Azure Active Directory business-to-business (B2B) collaboration users, are also supported. User must have a G Suite account. User must have a network username and password. User must have a work email address. Self-registration must be enabled. User must have an email address. *We can integrate with additional cloud-based Identity Providers (IdP) and Directory-As-A-Services (DAAS). Please contact us regarding your business case for this. Technically the integration is preferred to occur via OpenID Connect 1.0 (OIDC). Examples: OneLogin, Okta, and JumpCloud. If Azure authentication is enabled users are automatically registered the first time they sign in with their Microsoft work or school account. On the Sign in page. 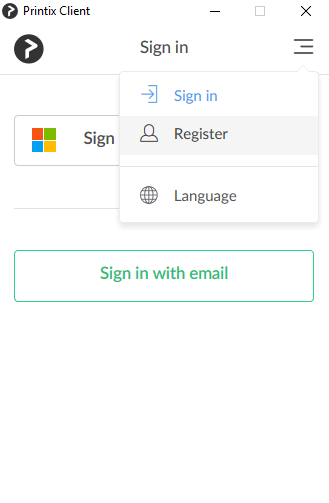 Select Sign in with Microsoft. 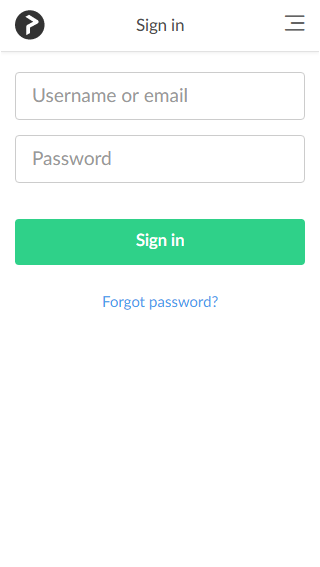 If you are already signed in to the browser with your work or school account, then you are signed in automatically. Enter your work or school account name. Accounts like (yourname)@(company).microsoftonline.com, should only be used if this is also an email account. Select Accept to grant these permissions. The user is automatically registered. 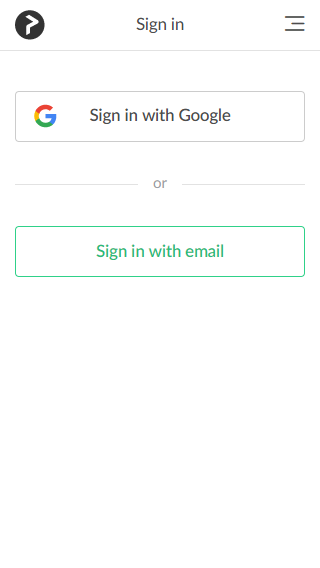 If you registered with your email address, then select Sign in with email and enter your email address and password. If Google authentication is enabled users are automatically registered the first time they sign in with their G Suite account. Select Sign in with Google. Enter your work or school account name. If Active Directory authentication is enabled users are automatically registered the first time they sign in with their network username and password. 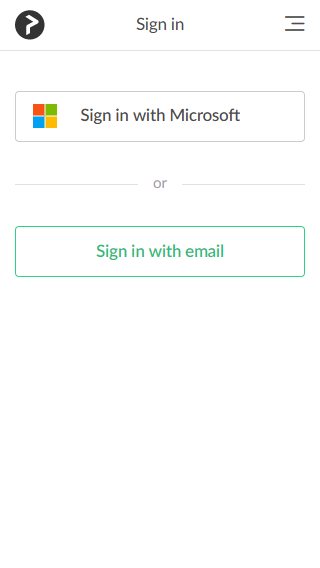 If Self-registration is enabled users can register themselves by their work email address. Open a web browser and enter the Printix Home (acme.printix.net). On the Sign in page select Menu in the top right corner. Self-registration is also possible from the Printix Client Sign in page. An email is sent to the user. Read the email: “Welcome to Printix at …” and select Get started. If the email does not arrive within a few minutes then check the spam/junk mail folder. After successful registration the user receives the email: “Get started with Printix …” and is asked to Download Printix Client. Users with an email address can be invited by administrators. If required change the Role of the user. Enter the user’s email address. The email “Welcome to Printix …” is sent to the user. If the email does not arrive within a few minutes then ask the user to check the spam/junk mail folder. 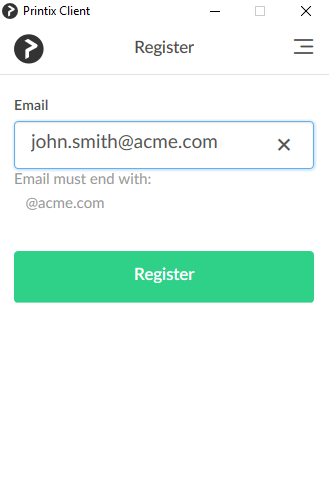 On the Users page the invited user is listed at the top on the with a ‘?’ until registration is completed. The invite is valid for 72 hours. Select and Info to see when the invite expires. Reads the email “Welcome to Printix …” and selects the link to Download Printix Client. In Printix Client, select Sign in with Microsoft. In Printix Client, select Sign in with Google. Reads the email “Welcome to Printix …” and selects Get started to register. After successful registration user is asked to Download Printix Client. If the role is System manager, the user is asked to sign in to Printix Administrator. The user also receives the email: “Get started with Printix …” with links to Printix Client and Printix App.